Speech delivered at World Policy Conference, Marrakech, Morocco on the 'State of the Nation'. 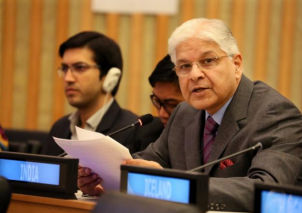 Speech by Dr. Ashwani Kumar, Member of Parliament on Science and Technology for Developing Countries at the STS Forum Meeting 2014 in Kyoto, Japan on 6th October, 2014. Speech by Hon'ble Minister of Law & Justice Dr. Ashwani Kumar at the International seminar on Recent Trends in Judicial Reforms : A Global Perspective at VigyanBhawan on 12th January 2013. "India and the Emerging Global Order" - Key Note Address at the 16th Asian Corporate Conference of the Asia Society Held at Mumbai Between 18th and 20th March, 2006. Speech during the inauguration ceremony of the International Symposium on “Accelerating India’s Response to Research For A Preventive HIV Vaccine” — August 13, 2012 at NDMC Convention Centre, Parliament Street, New Delhi.